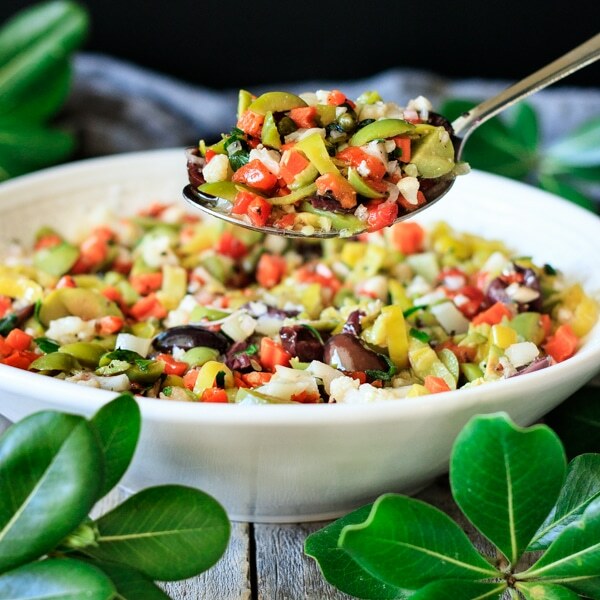 Olive salad is commonly used in a muffaletta sandwich, which originated in New Orleans at Central Grocery. 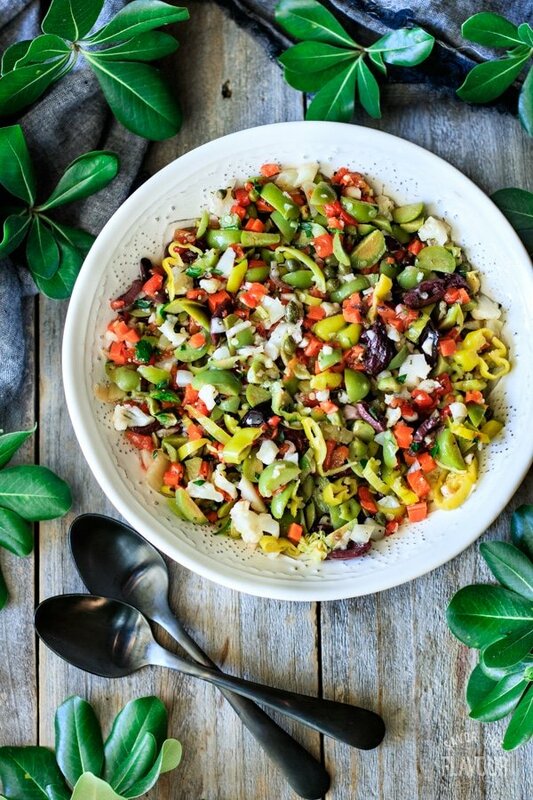 Green and black Kalamata olives, giardiniera, vinegar, oil, garlic, and other goodies round out this family sized dish that is great for picnic lunches or the Super Bowl. Are you a big fan of olives? 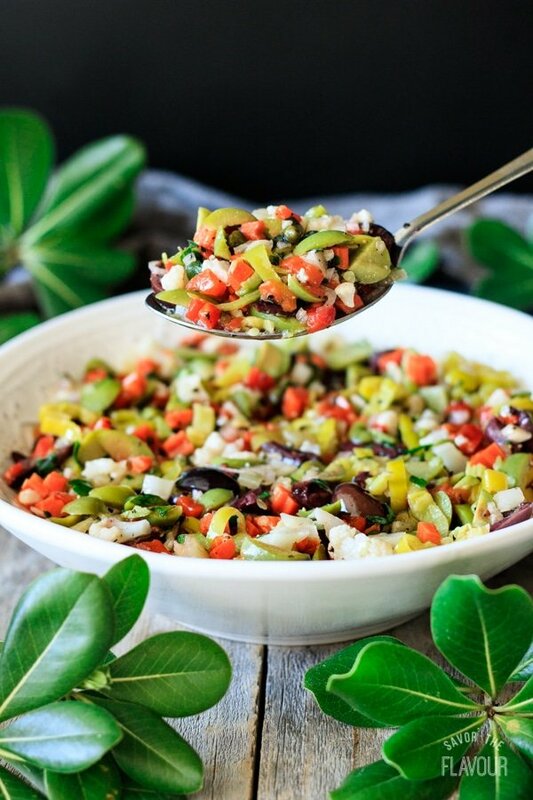 This olive salad will have you coming back for seconds. I promise it won’t last long. 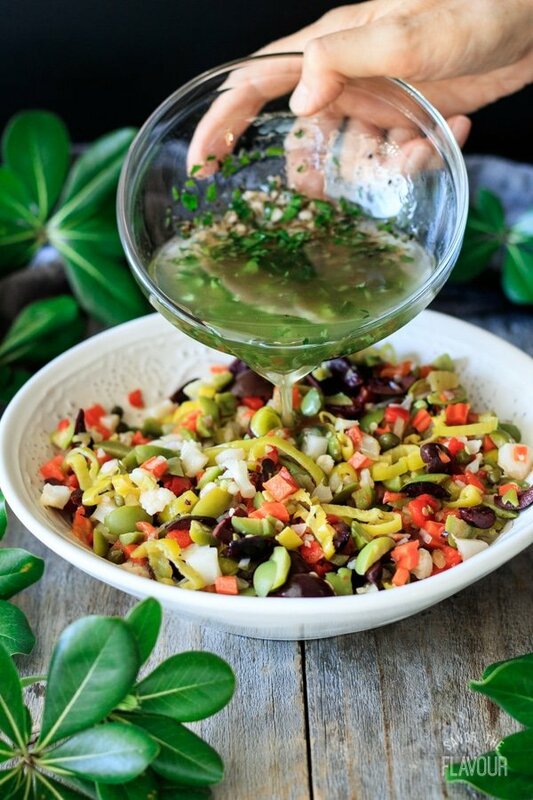 How do you eat olive salad? 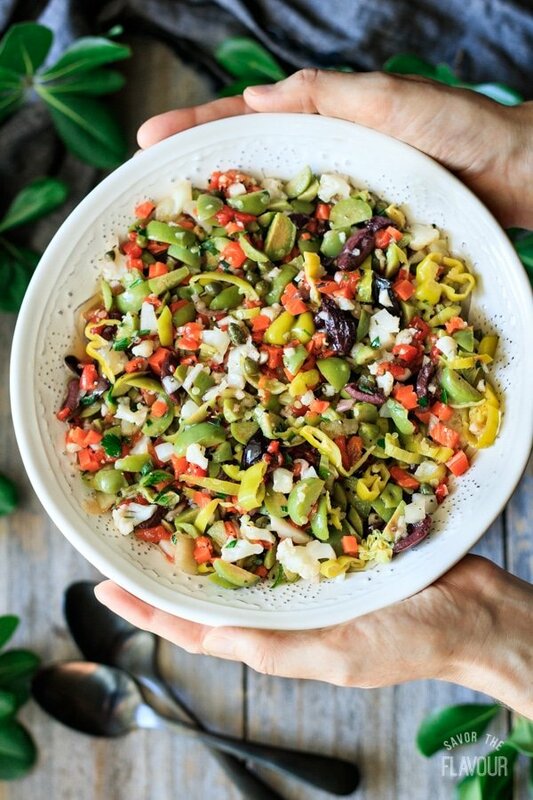 What ingredients are used in an olive salad? First, prepare all the ingredients for the salad and the dressing. Coarsely chop the olives, parsley, and oregano, then mince the garlic and shallot, and finely chop the pickled vegetables. Cut the ingredients small enough to be used as a spread. Get a mixing bowl and place all the salad ingredients in it. Mix it well with a large spoon. 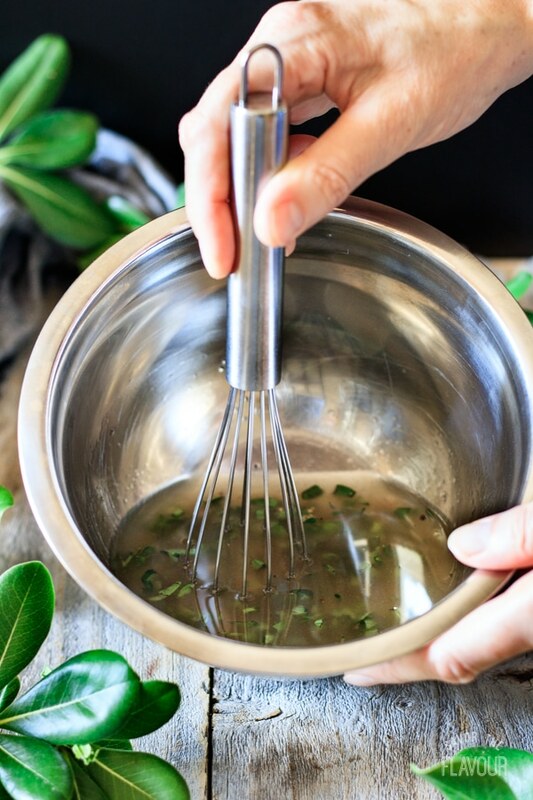 In a smaller mixing bowl, pour in the salad dressing ingredients. Pour the salad dressing over the olive salad mixture, then stir well. Cover and refrigerate for 8 hours or overnight to give it time to marinate. Use the best olive oil you can find. Have a ratio of 2:1 green and black olives. Use the cauliflower, carrots and celery from a jar of giardiniara (Italian pickled veggies). 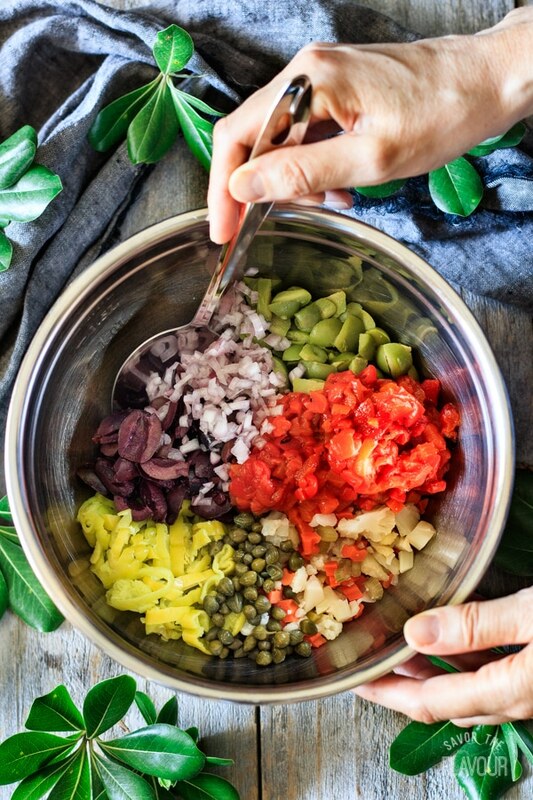 Add a signature ingredient such as chickpeas, pickled potatoes, canned artichokes, or cocktail onions. To change it up, add some olive or pepper brine or lemon juice. In a hurry? Use a food processor to chop the veggies. Chill for 8 hours or overnight to allow the flavors to meld. There you have it! 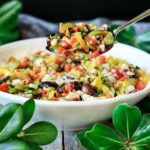 A super tasty olive salad recipe that will knock your next muffaletta sandwich out of the ball park. Trust me. Make an amazing muffaletta sandwich with these other recipes! 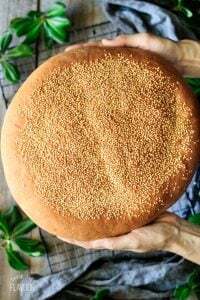 Perfect Muffaletta Bread: beginning bakers can make this round Italian-style loaf topped with sesame seeds. 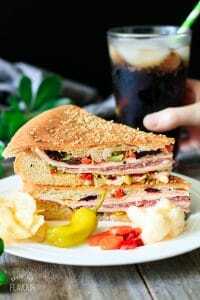 New Orleans Muffaletta Sandwich: a fancy sandwich packed with meat, cheese, and olive salad. Plus, it’s make ahead friendly. Did you make this olive salad? Share how you enjoyed it by leaving a recipe rating below. Whisk together the oil, vinegar, garlic, and spices. 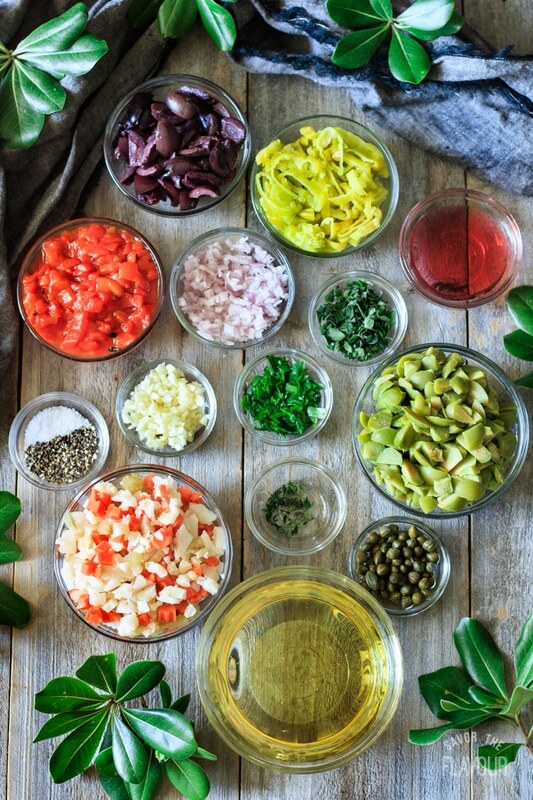 Chop up the olives, capers, peppers, and fresh herbs. 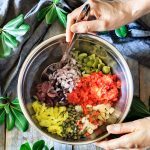 Combine all the salad ingredients in a large bowl and mix well together. Pour the dressing over the salad and mix well, then refrigerate for 8 hours or overnight. 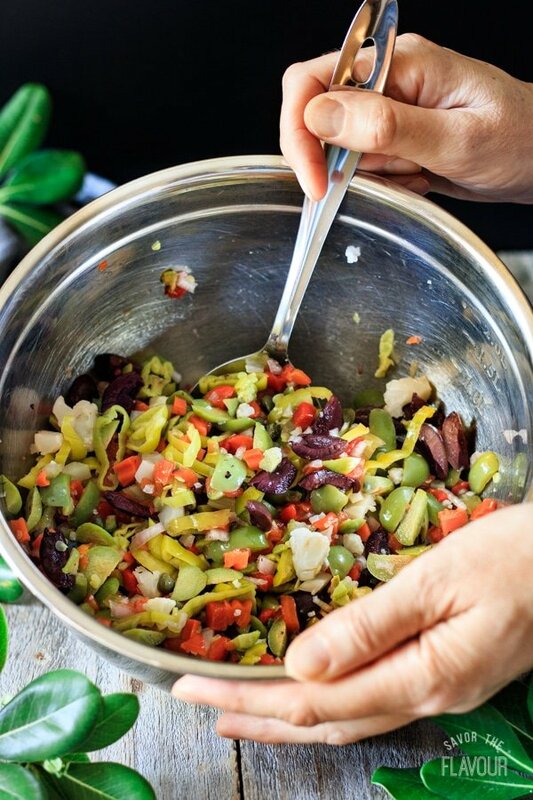 Stir to coat the veggies in the dressing just before serving or using in a muffaletta sandwich. Serve cold. 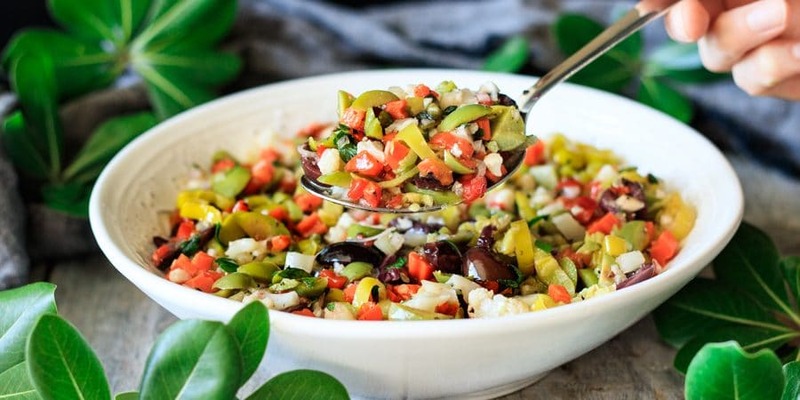 Olive salad can also be served in a muffaletta sandwich, mixed with lettuce and provolone cheese for a muffaletta salad, as a crostini along with goat cheese and prosciutto, or with cream cheese and parmesan cheese in a savory palmier. 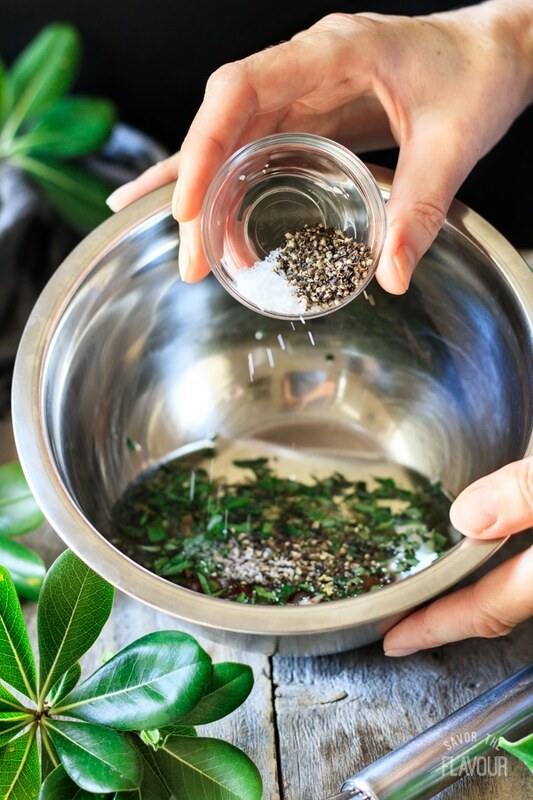 If you’re in a hurry, use a food processor to chop up the ingredients.